Across the sand dunes of northern Africa I’d already come off a few times in the deeper sand, but most difficult of all were the dreaded washboard corrugations. These were serious, bone rattling, bike damaging, morale destroying corrugations that went on for hours. The usual way to deal with this is to take courage and open the throttle to about 80-plus km/h, which can serve to smooth out the bumps. But this of course means you have little control as contact with the surface is reduced. Upcoming holes, ruts and bends present interesting challenges. And at times when the corrugations get very deep even the speeding-up trick doesn’t work. I had passed a broken down 4x4 earlier, and as we were hours from anywhere, paused to ask if they needed help. The driver shook his head sadly and pointed to a wheel - the tyre torn and in tatters off the rim. And apparently that was the spare. A little later, after hours of this torture, I suddenly felt the bike stalling, a losing power then pulling forward again. My first thought was maybe dirty fuel. I didn’t want to stop and risk not starting, so continued, hoping whatever it was would clear itself through the injector. And sure enough, after a minute or two the bike picked up power and continued running well. 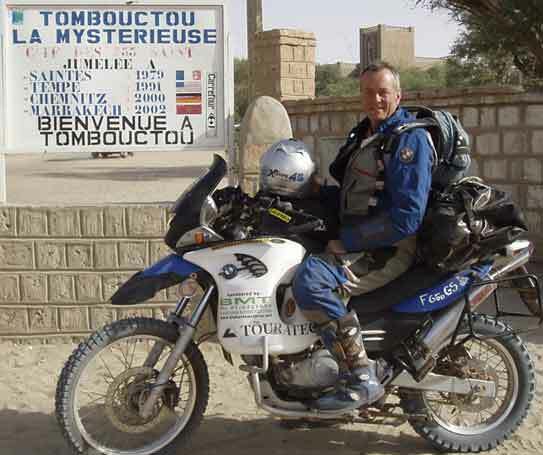 The fabled city of Timbuktu was the first destination on my solo motorbike ride from Kilkenny to Cape Town. My journey so far had brought me through Europe and across to Morocco, then down through the huge, desolate desert spaces of Western Sahara and Mauritania to Mali. The road conditions hadn’t been as severe as I’d anticipated. 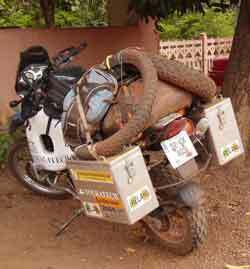 I found I was traveling most of the journey on my Conti Escapes, changing to the pair of TKC 80 off road tyres I carried when the going got rougher, and was getting quite experienced at changing tyres. They were really useful for that last day’s ride to up to the Niger river crossing for Tomboctou (as its spelt here). The attraction at this time of year was the annual Festival-au-Desert in nearby Essakane, an oasis at the confluence of a number of desert trade routes. Nomadic Tuareg tribes from throughout the southern Sahara region traditionally gather here once a year to trade, race camels, and generally socialise. In recent years, the music program has become a greater focus of the festival, the compulsive rhythms and chants of the music of the desert, and the seductive appeal of Malian music in general attracting a small but growing number of intrepid Western visitors to the event. And so it was that I jumped into one of the many 4x4’s for a hair raising and exciting four hour dash through the dunes to get to what is billed as the most remote music festival in the world. And what an occasion it was. Hundreds of Tuaregs in their striking robes, reclined imposingly high up on their camels, wandered about in small groups, majestically guiding their elegant, swaying camels through the crowds. Colourful turbans obscured all but their eyes adding a touch of mystique to these “blue men” - so called for the blue some dyed their skin – their presence adding an exotic atmosphere. The setting in the desert sand dunes gave the whole experience a “pinch myself, am I really here” feel. The music was magical. From the exhilarating energy of Basekou Kouyate and his troupe of n’gomo players - an instrument believed to be the precursor to the banjo - and the commanding three hour tribute to the recently deceased Malian guitar legend Ali Farka Toure, to the at times hypnotic rhythms of the Tuareg bands Terakfat and the more well known Tinariwen, the music was an experience guaranteed to revitalize any jaded music fan. For me it was a tremendous success – I had high expectations for the weekend, and they were exceeded. There was a sense of the surreal about resting in the sand outside a Tuareg tent in the late afternoon warmth, listening to Liam O’Maonlai on harp and Paddy Keenan on low whistle playing together with a few of the superb musicians I’d seen earlier on stage. Three days was enough – I was nearly overwhelmed by it all, beaten into submission by that very persuasive Malian rhythm stick! And as Timbuktu doesn’t have many road options – the same road out again didn’t appeal - I put the bike on a pinasse, a small local river boat, for the lazy three day trip upriver to Mopti. Seeing life from the river allowed a privileged glimpse of the mysterious Bobo people, fishing from small, poled dugouts as they’ve done for centuries. And the enforced idleness of the boat journey allowed plenty of time to reflect on and savour the many unforgettable memories from the weekend and the trip to date, and to contemplate the next stage – through Central Africa. More details and photos of Hugh Bergin’s journey can be found on his website www.kilkennytocapetown.com. He is raising awareness of and funds for the charity SELF HELP (www.selfhelp.ie).